Bentzin was a German camera manufacturer based in Görlitz, Saxony. The company was founded by Curt Bentzin (* 8. February 1862, † 23. May 1932). Bentzin was well-known for his innovative and high-quality cameras (f.e. Primar, Reflex-Primar, Primarette and Primarflex). He opened his first workshop in 1891. In 1893 he changed to a new production facility. With the help of Dr. Paul Rudolph the first negotiations opened in 1899 regarding a collaboration between Carl Zeiss and Curt Bentzin. Zeiss wanted to enter the camera making business to market their Anastigmats: Protar, Planar and Unar which Rudolph had developed the years before. Therefore Zeiss needed the competencies of Bentzin in camera making. In 1900 the "Aktiengesellschaft Camerawerk Palmos" was founded, which produced cameras at the Zeiss factory in Jena as well as at the Bentzin workshop in Görlitz. 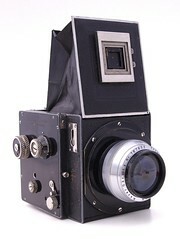 In 1900/1901 the first camera from this cooperation was launched: the "Film-Palmos 6x9". But in 1901 the companies bank ran into financial problems and Aktiengesellschaft Camerawerk Palmos was liquidated. Zeiss took over the production in Jena and Bentzin ran his own company again under the name: Curt Bentzin, Görlitz. In the following years an impressive range of SLR`s, field cameras and studio cameras was developed. Each camera was perfectly constructed for its intended use. Bentzin also produced high quality cameras for well-known german companies, f.e. Voigtländer, Emil Busch and others. After WW I the company founder retracted more and more from business. His son, Ludwig Bentzin, began working in the company to improve his skills. In 1928 Curt Bentzin handed over the company to his son Ludwig, his daughter Helene and her husband. In 1932 Curt Bentzin died at the age of 70. From 1939 on Helene and Ludwig Bentzin ruled the company together. In 1945 Ludwig Bentzin died and the company was repeatedly reorganized as part of the state-owned system, eventually being part of VEB Feinoptisches Werk Görlitz. In 1953 the camera production was stopped. The following list shows the cameras Bentzin produced over the years. British Patent 18705 of 1902, Improvements in photographic shutters, granted to Curt Bentzin personally, at Espacenet, the patent search facility of the European Patent Office. The patent descibes improvements in the arrangements for winding up a cloth focal-plane shutter. German Patent 536638 of 1931, Photographische Klappkamera, granted to the Curt Bentzin company, at Espacenet; the patent describes the form of a folding camera, with dished folding bed for great compactness; this may describe the Plan-Primar of about 1930; a similar design to the Patent Etui. A non-photographic patent: Swiss Patent 8209 of 1894, Hebewerk (jack), granted to Curt Bentzin personally, describing a general-purpose scissor-jack; at Espacenet. This page was last edited on 3 March 2017, at 11:39.